In honour of my new job my wife gave me this 1968 Memovox. The case is in great unpolished condition, both original crowns, and the dial has a beautiful even patina over the entire surface. 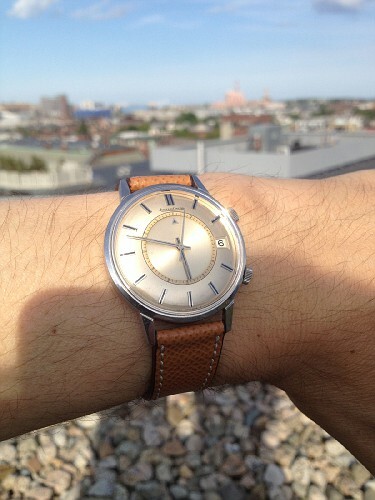 It's a manual wind 911 caliber and the case is large for a vintage watch - 38mm in diameter. All I need is a 16mm buckle to complete the time capsule look. I am waiting for the right evening function to take it out for it's debut.